Consumer Protection Law and Policy: Report on national and regional implementation of the United Nations Guidelines for consumer protection, Due to fast growing interdependence of the world economy and international character of business practices, there has been increasing recognition of linkages and the international dimensions of consumer protection. 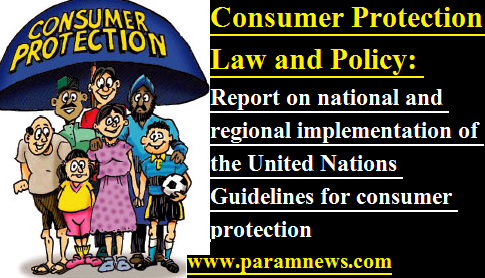 UN Guidelines on consumer protection therefore assume even greater importance. Statement of Minister of State of Consumer Affairs Shri CR Choudhary at Second Session of the Intergovernmental Group of Experts on Consumer Protection Law and Policy at Geneva. “On behalf of the Government of India, I extend warm welcome to all of you. As we all know, today consumer policy can no longer be viewed in isolation. Due to fast growing interdependence of the world economy and international character of business practices, there has been increasing recognition of linkages and the international dimensions of consumer protection. UN Guidelines on consumer protection therefore assume even greater importance. The essential function of the UN Guidelines is to assist countries in building and strengthening a comprehensive consumer policy framework. While these guidelines remains non-binding on countries, nevertheless it plays a crucial role in shaping up the national legislative and institutional responses to address the consumer issues. I am happy to inform you that a significant number of these guidelines has been used by India. We have also established a task force for studying and implementation of UNGCP which has identified areas future actions, and those recommendations are under active consideration of the Government. Under the dynamic leadership of Hon’ble Prime Minister Mr. Narendra Modi, India is making rapid strides in all areas of Consumer Protection. The Prime Minister has rightly acknowledged that growth of economy depends on the purchasing power of the consumer and ensured that consumer grievance redressal be accorded top priority by Government Departments, along with various other initiatives for protection of rights of consumers. India is a country of 1.25 billion people and we consider every individual as a consumer in one or the other form. In order to protect and promote the welfare of consumers, we have conceptualized a system comprising of; regulation and enforcement where a three tier system of quasi-judicial dispute redressal agencies and a robust system to redress grievances at the pre-litigation stage; partnership initiatives with voluntary consumer organizations, companies, academic institutions and civil society institutions; consumer education and awareness campaigns; ensuring of minimum levels of safety and quality, among others. One of the most important milestones in this direction has been the enactment of the Consumer Protection Act, 1986, covering all goods and services. The Act provides simple, speedy and inexpensive redressal to the consumers’ grievances through an exclusive three tier redressal machinery as an alternative to the civil court and other legal remedies available in the country, wherein an aggrieved consumer can approach against any defect in the goods purchased or deficiencies in services availed, including restrictive/unfair trade practices. It is one of the most progressive and comprehensive piece of legislations creating an exclusive three-tier quasi-judicial consumer disputes redressal machinery at the National, State and District levels. As on date, 659 District Fora, 35 State Commissions and the National Commission have been established in the country. As per the latest reports, the average percentage disposal of disputes in all three levels of Consumers Fora in the country is an impressive 91.23%. They were able to decide and dispose about 4.2 million cases since inception out of about 4.7 million cases filed. Government has also ensured through a Legal Metrology Act, reliability and accuracy of all weights and measures used for trade or commerce or for protection of human health and safety so that users are guaranteed for correct Weighments and Measurements. This in turn enables the consumer to get the right quantity for which he has paid for. The Legal Metrology (Weights and Measures) law in India also regulate the sale of commodities in “Pre-Packed form” through a Packaged Commodities Rules, requiring mandatory declaration of certain basic information to safeguard the interest of consumers. On 1 July 2017, we have launched a uniform nationwide Goods & Services Tax (GST) making India's tax regime more transparent, efficient at the same time easy to administer. Our Prime Minister described it as a tool for economical and educational empowerment of the poor and an instrument for economic integration of India. GST is expected to further strengthen consumers protection in many ways. The emergence of global supply chains, lowering of trade barriers, rise in international trade and the rapid development of e-commerce have enhanced the vulnerability to new forms of unfair trade and unethical business practices. Misleading advertisements, tele-marketing, multi-level marketing, direct selling and e-tailing pose new challenges to consumer protection and will require appropriate, swift and effective executive interventions to prevent consumer detriment. We are, therefore, almost rewriting our existing Consumer Protection Act, 1986 with a view to safeguard and strengthen the rights of our consumers. The new Consumer Protection Act is being drafted with features that include; Simpler Adjudication Process; Mediation as an Alternative Dispute Resolution Mechanism; Product Liability and; a Central Consumer Protection Authority (CCPA) to deal with unfair trade practices. India has recently enacted the Real Estate (Regulation and Development) Act, 2016 which seeks to protect home-buyers as well as help boost investments in the real estate industry. The Real Estate Regulation Act makes it mandatory for all commercial and residential real estate projects where the land is over 500 square meters, or eight apartments, to register with the Real Estate Regulatory Authority (RERA). The National Consumer Helpline originally launched in 2005 has been further strengthened and Integrated Grievance Redress Mechanism (INGRAM) has been established to provide backend support and engagement with the companies, for resolving consumer grievances. The Helpline deals with a multitude of problems arising in their day-to-day engagement with the market, business and service providers. At present the average call volume is around 40,000 calls a month and it is witnessing an impressive rise with more and more consumers being made aware of the system. We have also initiated awareness programmes through social media like twitter, face book, mobile app to convey messages of relevance to consumers in the form of alerts and advisories. We are observing National Consumer Day on 24th December, and the World Consumer Rights Day on 15th March for various consumer awareness programmes. Indian e-commerce is growing at CAGR of 45% and is expected to reach $80 billion by 2020. Laws regulating e-Commerce in India are still evolving. We are in the process of customizing the virtual world especially of the rural consumers who are the major target group for future. Technology enabled innovations such as Digital Payments, Hyper-local Logistics, Analytics driven Customer Engagement and Digital Advertisements have enabled the ecommerce industry in India to grow at a much faster rate. The launch of a Unified Payments Interface (UPI), it has enabled e-commerce delivery staff to collect money electronically for even cash on delivery transactions. Through BHIM, Bharat Interface for Money, a mobile app, digital payments has become even more convenient and came within the reach of common people. India is among the countries having a very large number of internet users. Government in association with a Partner Company has initiated a year-long campaign organising ‘Digital Literacy, Safety & Security’ workshops. India is fully cognizant of the emerging challenges posed by e-commerce and taking appropriate measures to address it effectively. We consider Consumer organisations as the voice of consumers and provide them stakes in decision making. Our approach have been to have them included in official advisory bodies designed to provide as source of external advice to the Government about consumer policy issues. We are trying to promote an atmosphere of self-regulation and discipline by manufacturers and dealers in their trade practices. The resultant outcome of such efforts is that the confederation of Indian Industry (CII) who has a membership of around 8300 Industries and corporates, has recently launched its first Award for ‘Customer Obsession’ which was given to companies who adopt consumer friendly practices in their trade. We have set up Consumer Welfare Fund at the Union Level with an objective of providing financial assistance to promote and protect the welfare of the consumer, create consumer awareness and strengthen consumer movement in the country, particularly in rural areas. Under the Consumer Welfare Fund, any organisation engaged in consumer welfare activities for a period of three years and is legally registered are eligible for seeking financial assistance from the Fund. Now, we are setting up Consumer Welfare Funds also at State level to increase the coverage and horizon of disseminating relevant information to the consumers. In order to ensure standards and quality, the Bureau of Indian Standards formulates standards that promote quality of goods and services. The Bureau provides technical support to industries and services sector by way of updated standards, developing new standards in emerging technologies, and providing certification of goods and services for ensuring quality and safety. It also harmonizes National standards with International standards in order to facilitate adoption of International standards by industry and thereby facilitating trade. This is off-course work in progress and we expect a major overhaul in coming years. Till the year 2016, 5049 Indian Standards have been harmonized with International Standards. Sustainable consumption pattern is part of our ancient texts, cultural ethos and reflected in our way of living which is primarily guided by Yogic philosophy. We are happy to note that Agenda 2030 has captured this under Goal No. 12 and efforts are made world-wide to mainstream this philosophy in all walks of consumption and production. Some of the notable actions taken by India includes, rejuvenation of rivers and water bodies, national mission for sustainable agriculture and nutrition management, investments in renewable energy and its efficient utilization, forestry and agro forestry, control on wastages and recycling of products, green building codes, etc. Food security is one of the commitments of our governments to the citizens. As a welfare measure the government provides rice, wheat and coarse cereals to nearly 810 million population at highly subsidized prices. The exercise of such high magnitude presents procurements, supply chain management and distribution challenges which are sincerely undertaking as a welfare state. Before I conclude, let me quote Mahatma Gandhi, Father of our Nation who said “The difference between what we do and what we are capable of doing would suffice to solve most of the world’s problems”.